Be prepared… There are semi spoilers ahead…. I ran into this movie today while scanning Netflix. And I was curious to see it since it is based on a book from Nicholas Sparks. I do own a couple of his books and enjoy reading them. But I have never read this particular one. I wish I had though. I would have never watched the movie. Not because it is an awful movie; but because it has a heart breaking sad ending. And I hate endings that are not “Happily Ever After…”. I was not prepared for this sad ending. My heart is still trying to cope with it. The movie itself is wonderful. Great plot even though I can not personally see myself as the main female character. I can relate to her with how much one person can love another. But I can not relate to how she could marry someone she truly did not love and suffer all these years with someone she grew to hate. The beginning was so touching to see how this man saved this teenager instead of calling the cops on him. You hardly see these situations nowadays. People just do not trust runaway teenagers. But this man had a huge heart. And because of his heart, Dawson was able to live out his purpose in life. It just makes you think just how much just one person can influence the rest of your life. Where you ever in a situation where you thought you had no where else to go? At the last breath you might be taking? A time when your dreams were completely crushed? What happened? Did someone save you just as this man saved Dawson? Or maybe it was just a chance encounter with a stranger? There is a purpose to our lives. There is an end of our path that is already mapped out. It is scary to think that we truly have no control since we are all destined for something. All we can do is live the best as we can with the life that we are given. I do hope, though, that my life will have something very meaningful to come out of it. The movie touches on a lot of major life topics that are great discussion subjects. Love, first date, lost loves, horrible parents, child abuse, rich vs poor, education, cancer, child loss, loving a child that is not blood related, beautiful set locations, gardening, etc. The list goes on and on. And I could write a book if I wrote about each one. Overall this is a great movie with good beautiful actors. The actors were able to make us visualize just how pure their love was. And the love between a true “parent” and child was spot on. Great movie. But would I watch this again? Sadly, no. Just because there is already too much pain in real life that I go to movies to escape it. And this movie did not help me escape from pain. Only added more sadness. 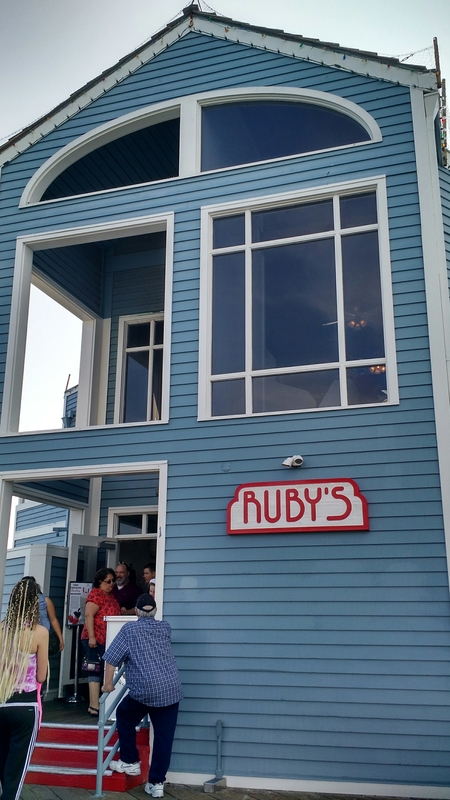 Today, my husband took my daughter and I to eat at Ruby’s Diner in Oceanside. Since it was Valentine’s Day, the weekend and we wanted to eat on the upstairs patio, I prepared myself to wait a long time. Once we got there, there was even a line to put down your name on the waiting list. But, we were in no hurry. The waitress told us the wait will be 1 hour and 30 minutes. Ouch… Well, we were still going to wait since it took us so long to even find a parking spot! We had a fun waiting time trying to keep our 5 year old occupied. I noticed that some groups decided to leave after already signing in. Better for us. In about 50 minutes, we were seated. They seated us upstairs on their patio with a beautiful view of the ocean. Since this special location is located on a long pier, the ocean views were endless. My daughter ordered the Kid’s Cheeseburger Meal. My husband and I had the Hickory Cheeseburger and Chicken Strips. All hamburgers come with unlimited fries. With my first bite, I realized how delicious our dinner was going to be. The hamburger was amazing. Thick and well seasoned. The hickory sauce was lightly sweet. The chicken strips were perfectly crunchy. And paired with their three different sauces (ranch, barbeque, honey mustard), it tasted delicious. The unlimited fries were warm, crunchy, and the perfect size to also dip into the sauces. After finishing our dinner, we had to make the almost impossible decision of picking out dessert. We were down to two choices. Hot fudge brownie with ice cream. Or Apple Pie al la mode. My daughter finally picked the brownie. The dessert is so huge that all three of us were able to share and be completely satisfied. It was delicious. Warm fudge. Cold ice cream. Sweet brownie. Added almonds in between. With a lot of yummy whip cream on top. One thing I would have loved for our waitress to have done better was to refill our waters. But I do understand that they were extra busy today so I will not hold that against them. My family had a wonderful time eating at Ruby’s. And I know that my family will be going again. Hopefully on a less crowded day. 🙂 I will definitely recommend this Diner to everyone who loves eating delicious food and wants to have an amazing ocean view. I hope everyone else enjoyed their Valentine’s Day 2016. Another great buy at the Dollar Tree store. Online sells for $3-$15. This book was a lovely romantic book. It was a fast and easy read. A nice love story to remind people that true love will always find each other. I did have a hard time believing that a widower could move on so fast after his wife’s death. And even harder time understanding why his little girl was pushing him so hard to get remarried. For me, the time was just too soon. I loved the connection that the two main characters had right away. A connection that they felt but was a little afraid to believe it. And the author had a great idea on what actually brought the two together. Uniquely written. I was hoping that in the end, they found out the scarf was actually from Grace. Just something else to show their love was meant to be. I also felt like the book was missing an ending. The “how are they living now?” kind of chapter. The book ended on a happy note that filled your heart with love. An ending that was expected but still nice to read. Overall, this book was good. Easy flow. Good topics. For the romantic readers who loves a happy ending. I love so much that I have been able to set some time during the day to read. It really helps my stress level. Life has been so busy that I have been missing one of my favorite things to do. Reading. I have always loved reading and can proudly say that is one thing I received from my dad. The love of books. 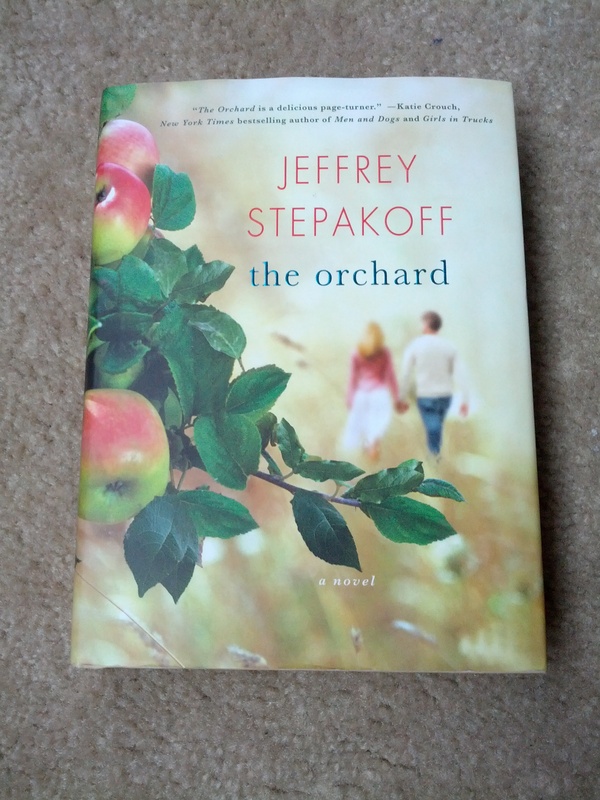 So I was finally able to finish reading a book yesterday. 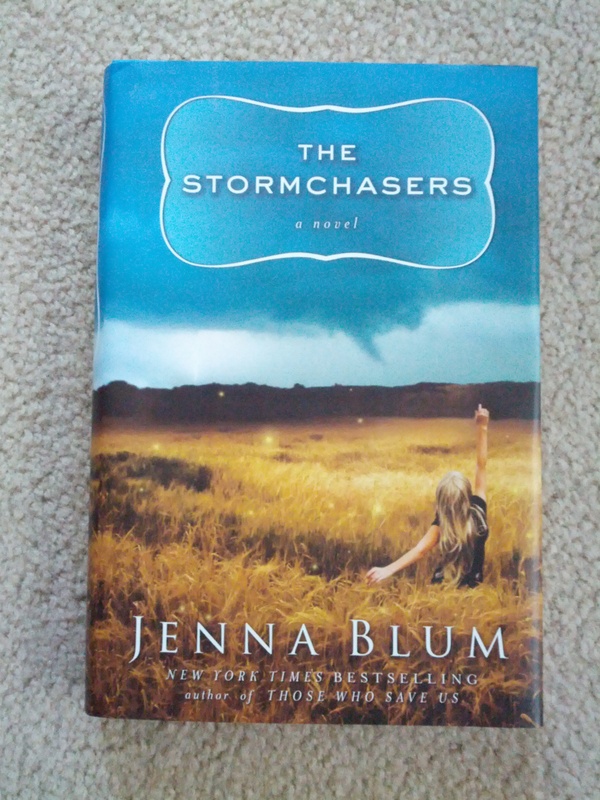 Stormchasers by Jenna Blum. I came across this book at the Dollar Tree. It looked like a good book and only $1. So I gave it a chance. Too be honest, when I first started reading this book, I fell asleep. My mind just was not interested in this topic. And the rhythm was sort of slow. The next day, I forced myself to keep reading because I have always needed to finish a book once I start. I was happy that the book got more interesting and turned out to be an OK book. The main subject of this book is mental illness and the affects on family. The author ties this illness with tornadoes. Really great analogy to use. I do not have a lot of experience with bipolar so it was nice to read about a sister’s point of view. Another point of this book is secrets and how it can’t take over your life. The author does very well in describing just how much one huge secret can mess up your life. I loved the tornado chasings and the little love story. The book could have used a little bit more action. The ending was sort of expected. But a happy ending is always a good ending. This was a good book to restart my love for reading again. Excited for my next book find.